Tax season is here, and we know that can be a stressful, chaotic task getting all of your documents together, knowing what paperwork you need, and all of the confusing number that go with filling out and filing your taxes. This 2019 tax season, Oak Hill Collaborative , United Way, and VITA have teamed up to work with volunteer tax professionals to help you get your taxes done for free! We want you to keep the money you worked hard for during the 2018 year. 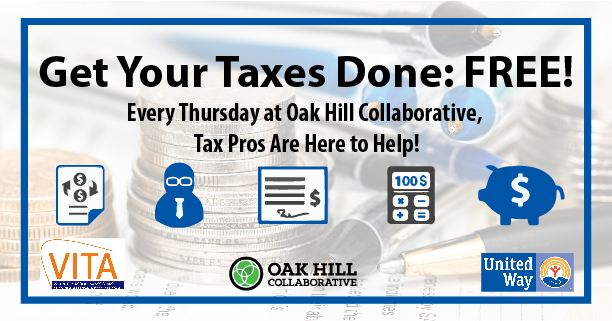 Oak Hill Collaborative will be open for your tax purposes every Thursday during the 2019 tax season from 4 pm to 6 pm. No Appointment is necessary, but slots do fill up. To make an appointment, please call 330-540-1947 or email [email protected] . For more information, please visit VITA’s webpage showing all details.